If you haven’t visited Egypt to explore its rich ancient culture then you must definitely play the Egyptian themed slot game named Fruits of Ra developed by Playson. From the name itself, we get a clear picture that this particular slot game has been influenced from the Egyptian God Ra. It has relatively nice payouts and moreover it provides a better gaming experience to the players as the interface is neat with absolutely no stuttering. Fruits of Ra slots might look a bit old-fashioned but the seamless performance aids the players to enjoy the smooth gameplay. The Playson developed game is known because of its unique representation of the fruits which have been beautifully incorporated into the Egyptian frame. Fruits of Ra has 5 reels and 5 pay lines and has an array symbols in the form of juicy fruits. The online slot casino comes with symbols like plums, oranges, grapes, watermelons, and peaches which look very delicate on the screen. Like few of the other slot games which have fruit-centric symbols, this online slot also has the number 7 which represents the highest valued symbol amongst all the symbols. Apart from these general symbols, Fruits of Ra online slot machine also consists of a wild symbol and scatter symbol to enhance the gaming experience. The Scarab Beetle represents the wild symbol which can substitute every symbol in the slot machine except the scatter symbol. The scatter symbol is denoted by a five-point star and if the player is quite lucky to land all the 5 scatter symbols, the entire bet value gets increased to 100 times. These symbols are bordered with pillars supported by a wall in an Egyptian tomb. This ancient looking theme is indeed a pleasurable experience for the gamers who like a traditional touch during the gameplay. The players can select the coins size by adjusting the bet value by clicking on “Bet” buttons which allows the players to select the coin size ranging from 1 to 20. If the player is willing to do the gambling at the maximum bet value, it can be done by clicking on “Max Bet”. The pay lines are adjustable and can be adjusted according to the player’s preferences by pressing the “Lines” button. The “Spin” button lets the reels to roll and this spinning of the reels can continuously happen if the player wants to let the reels spin uninterruptedly by hitting “Autoplay” button and selecting the number of spins. There is a feature named “Gamble” which lets the player gamble on the basis of their playing skills to add on to his/her winning coins. Any player can play free Fruits of Ra casino slot machine which is an additional advantage to the numerous features that it already provides. There is neither any requirement to spend real money to play this slot game nor the player needs to deposit any amount to gamble. The payouts are not excessively high but the coins that a player can receive through the symbols are not even too less. The watermelons and grapes are the highest valued symbols among the fruits which pay the player multiple of 1000 while the highest paying symbol number 7 can pay you up to 5000 times the bet value if all 5 of the lucky 7s land on the pay lines. The sound effects and animations, while the coins are being received, has been kept quite simple. This UK developed slot game has no such mentionable features which could make Fruits of Ra a popular slot game yet there is an interesting Gamble feature which can skyrocket the number the coins. A player can wager for 5 times at a stretch and the only thing a player needs to do is to guess either the suit or the color of the next card which is to be drawn. If the player fails to anticipate correctly, s/he will lose the winnings and will be redirected to the base game. This cannot be the best additional feature for any slot game but it definitely can increase the coins by leaps and bounds. In Fruits of Ra online game, there is no such jackpot which could assist the coins count and hence every player needs to maximize the coins through the other features which have been discussed already. 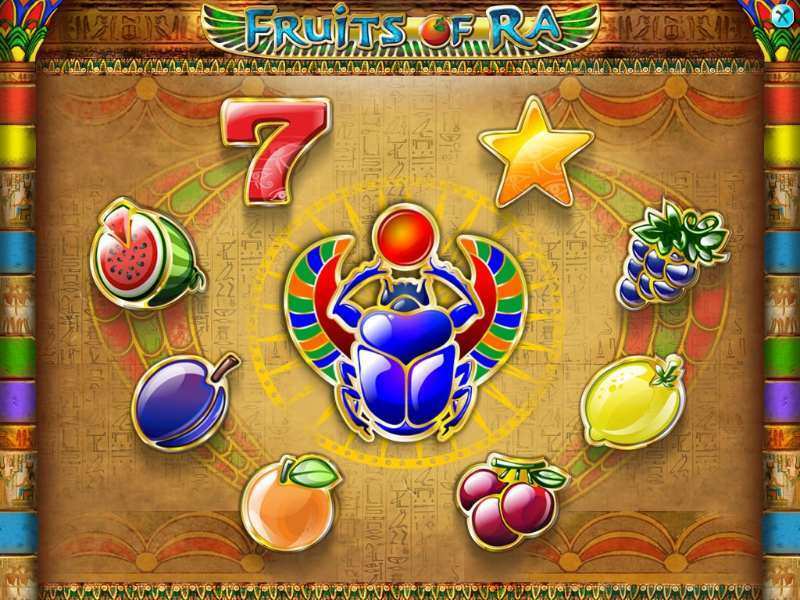 Fruits of Ra is such an online slot game which first of all requires no download at all to play this game which is a great advantage in regard to how the game is being played. There may not be any intricate bonus features but this slot game has really a lot to offer and if the player is quite skillful, s/he can surely rack in a lot of winnings. 0 responses to "Fruits of Ra Slot"